Ozeri BP2M CardioTech Premium Series Digital Blood Pressure Monitor is a wrist monitor and is clinically tested and used all over the world by doctors and in hospitals. 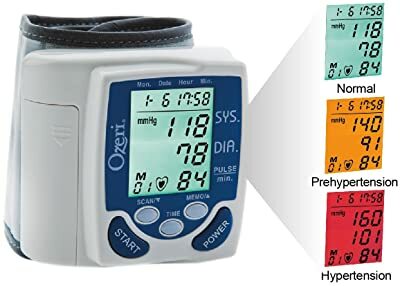 Ozeri BP2M CardioTech Premium Series Digital Blood Pressure Monitor comes with advanced wrist cuff blood pressure monitor and MWI (Measure While Inflate) technology. The MWI technology can inflate the cuff to the appropriate level automatically, by detecting blood pressure in real time. This dynamic measurement technology will reduce measurement time, thereby offering greater accuracy. This technology will keep you very comfortable and avoid over-tightening of the cuff. whether it is an upper arm or wrist monitor, the accuracy is greatly affected by the cuff fitting. There were few assumptions regarding the accuracy of the wrist monitors, however in recent times, the wrist monitors are equally accurate compared to counterpart. The Ozeri blood pressure monitor records average of 3 recent readings for better accuracy. The cuff of the Ozeri blood pressure monitor is designed in a way that it can fit above average arm size making it suitable for everyone. The MWI technology provides convenience and ease of use. This technology helps users to overcome issues related to the rhythm of the heartbeat because this might lead to fluctuations in blood pressure. Ozeri BP2M CardioTech Premium Series Digital Blood Pressure Monitor can store blood pressure reading up to 1197. It is a multi-user device. The memory recall for three individuals is 3* 399 readings.This feature help you to review the readings for previous months because readings are stored with date and time stamp. It detects the irregular heartbeat that occurs while measuring the blood pressure. This tracking will help you to understand your heart’s health. It has most of the features of any premium brand but at the budgeted price. Ozeri BP2M CardioTech Premium Series Digital Blood Pressure Monitor does not belong to any famous brands like Omron or Panasonic, but the features it contains are more better than the features of the mentioned brand and in good rate. The only problem is not many people are aware of this brand or it’s origin. A Lot of doctors uses this monitor to measure the blood pressure. If not particular about the brand then this can be your choice for wrist blood pressure monitor. Ozeri doesn’t seem to be maintaining User Manual online. You can request one by mailing at support@ozeri.com. They are responsive in emails and often sends manual as attachments. I would to have a owners manual for the Ozeri modelBP2M. The one in the box is for the old model.